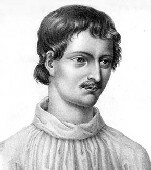 To realise that there have been terrible acts of barbarism committed throughout history we have only to look at the tragic life of Giordano Bruno. He was born at Nola near Vesuvius in 1548 and grew up to have one of the most enquiring minds of his age. He was frank, outspoken and lacking in reticence and was gifted with the most amazing memory. It was not an uncommon thing for scholars to wander from place to place and soon Bruno started his long journeys across Europe. In 1574 Bruno spent some time in Geneva, the home of Calvinism. In 1581 he went to Paris and began to give lectures on philosophy. Bruno found a royal patron in Henry Ill and it had much to do with the success of his short carrier in Paris. There came a time when Bruno felt that it was time to move on. He went to England to begin over again and to find a fresh audience. While in England he had a personal audience with Queen Elizabeth I. Soon he was to go on his travels again and he went to Germany. Between 1582 and 1592 he was persistently, openly and actively spreading the news about the discoveries of the Polish mathematician Mikolaj Kopernik (Nicolaus Copernicus). All the time Bruno was spreading his ideas across Europe and writing numerous books. From the point of view of this website his most notable contribution to philosophy was his work entitled De l'Infinito Universo et Mondi (On the Infinite Universe and Worlds) which was published in 1584. In this work he stated that the stars were other suns and were surrounded by planets some of which were inhabited by people. Finally he made the fatal mistake of returning to Italy. In Venice he was tricked and double crossed and handed over to the authorities in Rome. He was imprisoned for 8 years and horribly tortured. Despite this he refused to recant and held on firmly to his ideas. Finally at the age of 52 he was sentenced to death. 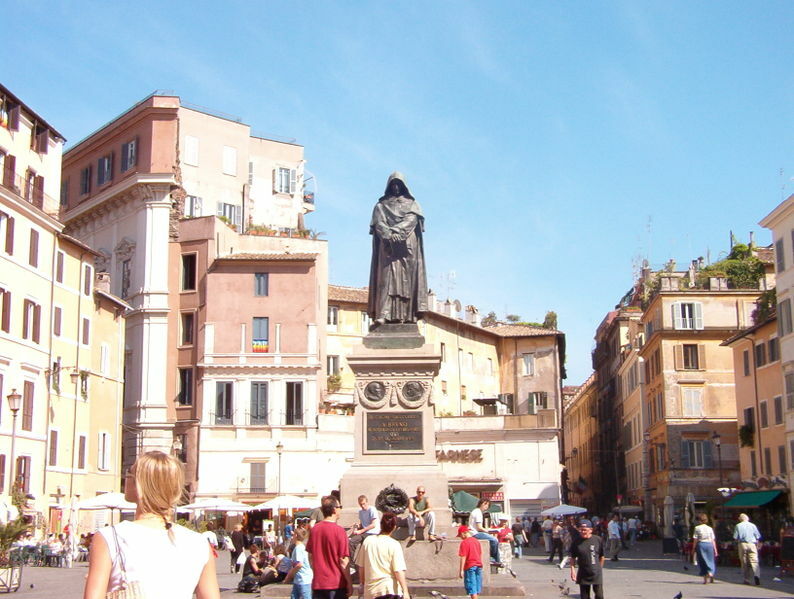 On 17 February 1600 he was burnt at the stake in the Campo del Fiori in Rome and his ashes were thown into the Tiber. He has not been forgotten - In 1897 a statue was erected in his honour in the Via dei Fiori where he had been burnt to death. Five hundred and ten years after the judicial murder of Giordano Bruno, Lord Martin Rees in the Reith Lectures (third lecture BBC 4) mentioned him and said that two of his statements had been proved by modern science. Namely that the stars were other suns and that they were accompanied by planets. As to his third supposition we are now actively engaged in searching for life on planets outside the Earth. The picture on the top right was drawn in Paris by C.Meyer Image: Christian Bartholmèss, Jordano Bruno (Paris: Libaririe Philosophique de Ladrange, 1846). 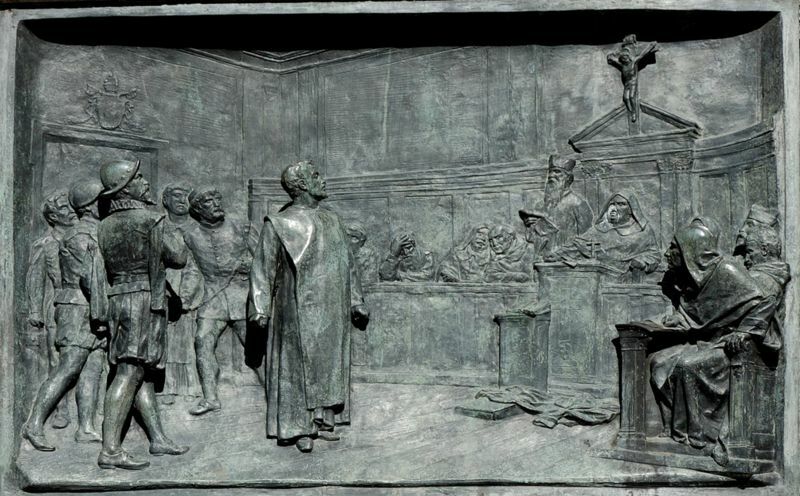 In the bottom right we see a bronze plaque of the trial of Bruno by the Roman Inquisition by Ettore Ferrari. The picture on the left shows the statue erected in the Via del Fiori in the place where he was burnt to death.